The audience at the inaugural session of the Indian Science Congress was neatly divided into manageable chunks. Security was high and crowd control was important. As many as 18,000 delegates and 200 scientists were present. We waited patiently for the PM to arrive. It was only after the promotional video on ISRO's satellites was replayed at least five times and three false alarms were sounded that the PM arrived and the programme began. The theme of this year's congress, 'Science and Technology for National Development', seemed to resonate with the research community, state government and the centre alike. Make in India was talked about. But their optimism seems misplaced as the same scientists have been talking equally optimistically ever since the debut of this Congress 104 years back. Using science and technology for developments is a major goal. However, the researchers and politicians at the inaugural meeting had very few examples. Other than the success of ISRO's mission, other examples are pretty weak. Chief Minister of Andhra Pradesh, N Chandrababu Naidu's example of the use of biometrics in the public distribution system and use of LED lights, though helpful to the general public, are imported technologies. 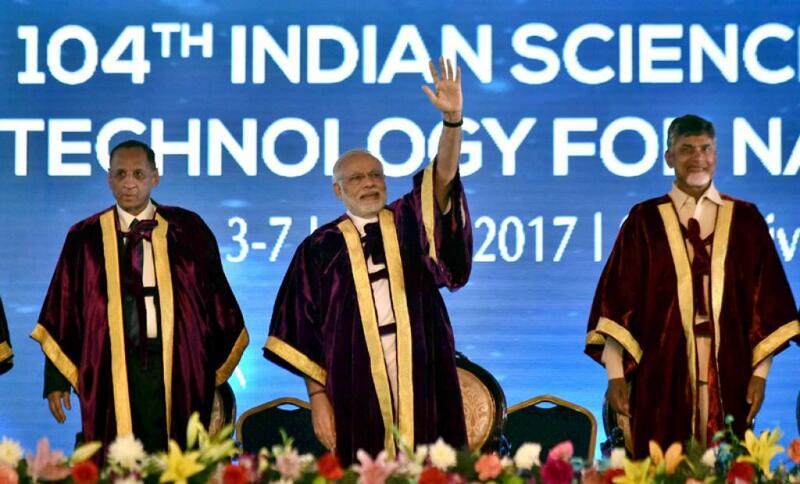 PM Narendra Modi said that to ensure we have technologies we need in future we need to invest in researchers now. He was joined by General President of the Indian Science Congress Association, D Narayana Rao in talking about ease of research. But we should figure out how we can provide this ease. Modi's suggestion was to promote PPP model to ease access, maintenance, redundancy and duplication of expensive equipments in scientific institutions. But how will it affect independence of research? Is this the only way? This should be one of the debating points at the meeting, however it is not.